Can you be more specific? Did you start a new game and have your first Inhibitor Mod just fail to make any difference in how the terrain tool works? Did it not do what you expected it to do? What happened when you put it on and used the terrain tool? Was there any appearance difference? Did attempting to use it make the same sound it did when you have used mods in the past? Have you made any other mods? Do any of those work? Any extra information you can give would always help understand the problem you are having, and hopefully give the devs something to look for. I mean, the Inhibitor Mod just makes it so the Terrain Tool won't actually remove or add soil, but will siphon up any surface resources like organic material (if it's fully grown), surface nodules of Resin, Compound, etc... What exactly happens/does not happen? Ok, so I've been playing in a single save since the update, and have noticed some progressive issues (that is to say, no issues at first, then some...then more) as I've played, and thought I'd stick in a list of the things I've been seeing. Many of these have been reported, but not much (if anything) about the sequence of events... Started the save: It was great. No issues, fun gameplay, love the new additions. Playing for probably 4-5hrs overall: discover that I cannot get into my rover every time, but if I remove the seat, and put it back, I can get into it again. Decide to print a Small shuttle. Print an enclosed 1-seat cockpit on the shuttle. Blow up shuttle with dynamite to see if cockpit will survive (as in earlier builds). Shuttle has other ideas, refuses to blow up. Hangs in mid air, but low enough to allow me to remove the cockpit (no problem there), add an open 1-seat spare I have, add some Hydrazine I have lying around, and launch (with open seat). Land back in base at about the same angle it had been floating in the air (some 50 degrees off vertical), but properly at vehicle bay. Bay displays print options for shuttle, but all show red. Re-launch shuttle and land elsewhere, lands properly. Re-launch and return, now parks properly at vehicle bay, but still NO print options show anything but red. Cockpits, storage, everything it shows willing to print, shows red on shuttle even with power and supplies. This shuttle STILL cannot have anything printed on it. 6-9hrs or so: Seat issue has advanced. Now, if I cannot get into the seat, and remove it to gain access, if I point away from it for even a split-second, I once again cannot access the seat without removing it. Access to the seat will sometimes be several times in a row, then have to remove it every time for the next 8-10 times straight. Sometimes till I exit the game and re-enter. Really wishing that 'enter seat' were a different key than 'terrain tool'... 10+ hrs. Have been playing fairly casually, just enjoying the game. Finally quit slacking off, built a Large Shuttle and went planet hopping. Arid spike balls still hang at the edge of the 'physics zone' around me, I see. Nothing new there... Terrain deform tool still jumping around unless you just hold it still and walk in a straight line (not jumping while just sitting, or not using it, but once you start using it, and move it from side to side especially). This is still around from earlier builds. Was hoping, but there it is. Is coal supposed to be a bland grey? Or is it supposed to be semi-gloss black (as I remembered from earlier builds)? Couple trips out and back. Finally take a break and log out. Next time I start playing the game, I'd saved in the open 1-seat on my Large rover. It SEEMED normal at first, but as soon as I got out, it jumped up, like I'd thrown a half-ton weight suddenly off of it (did I gain weight out in space??). Got back in, then out. Same thing, to varying degrees. Geared up for a mining run to a local cave (need aluminum), when I stopped and got out, the rover actually popped up fast enough to flip upside-down. (!) Obviously, I'm going to have to start testing other things (disappearing research blocks, maybe), and will further post as other issues occur. An excellent point, Martin. So...which direction is his base from where he stopped his rover? I've always hated people that act like a compass will solve your being lost issue. A compass will only help if you consult it any time you change directions, and make some sort of note as to which direction you turned, and when. OR if you have a map...oh wait. 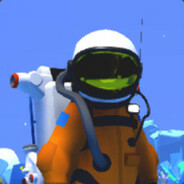 There IS no map in Astroneer, and unless you get out of your rover every time you want to turn, you CANT SEE the compass. Yeah. Big help, Martin. Thanks. Is it possible to play an older version of this game? That would be the one with Argyle socks and a subscription to 'Wine Snob Monthly'... =P But to keep it on track...: ORANGE ASTRONEER FOREVER!!! Often imitated, but NEVER duplicated! UNSURPASSED IN ALL WAYS! Even NASA knows! ...and at 8 canisters of soil to make one titanium, you can give yourself the coma-inducing job of filling canisters with dirt for hours at a time for the joy of unlimited research... Yeah, I tried this route right after the soil/extractor update came. It works, but I tore down an entire mountain to do it (was actually just doing it for mostly lithium, but still) and it was, bar none, the most BORING playthrough of an Astroneer save I had EVER played. Frankly, a large rover or two with large storage and beacons to set your return path bringing research boxes back is WAY more satisfying... the problem these guys are having is that it's also awfully boring just standing around your base waiting for your multi-thousand byte sample to process, when leaving before it's done can make it just vanish. Even in your 'infinite research' trick, you STILL have to stand around waiting for it to finish being processed... I'm just glad I haven't had this issue. All my research blocks (so far) have stayed where I put them, and continue to process even after I leave and seem to run full cycle. I really feel sorry for the folks that have to deal with this. It would be VERY frustrating. I hope this can be isolated and fixed soon. Good luck guys. Ok, I think I know what you mean now... I don't think that's actually precipitation, more like airborn dust that indicates the current air flow. Well, I think it's INTENDED to be such, but wind is a little...weird currently, because it's not all across a given area, but instead is in patches that increase or decrease as code demands...it's just weird. But your slowdown caused by the air particles...have you tried turning some of the graphics settings down? Like Post Processing or Effects? I'd start with Effects, but that's up to you. Congratulations on finding your base! And yeah, the more you drive around in a Rover, the better you get with flipping it upright and digging out smooth ramps you can climb out on... Yeah, I think the way the devs said it was that they wanted you to be able to (in the event of getting totally lost) print out a small fabricator and just start a new base that won't have a habitat until you research/print one, but that you can just start over. In earlier version (without the small fabricator) there was nothing you could do but keep searching for your base, because you could only build a base from the habitat. Lose that, and you were dead in the water. Have fun! Please, increase traction for the rover.